New clues as to how the Earth’s remote ecosystems have been influenced by the industrial revolution are locked, frozen in the ice of glaciers. That is the finding of a group of scientists, including Aron Stubbins of the Skidaway Institute of Oceanography. The research is published in the March 2012 issue of Nature Geoscience. The key to the process is carbon-containing dissolved organic matter (DOM) in the glacial ice. Glaciers provide a great deal of carbon to downstream ecosystems. Many scientists believe the source of this carbon is the ancient forests and peatlands overrun by the glaciers. However, Stubbins and his colleagues believe the carbon comes mainly from contemporary biomass and fossil fuel burning that gets deposited on the glacier surfaces. Once deposited on the glacier surface by snow and rain, the DOM moves with the glacier and is eventually delivered downstream where it provides food for microorganisms at the base of the marine food web. Glaciers and ice sheets together represent the second largest reservoir of water on earth, and glacier ecosystems cover ten percent of the Earth, yet the carbon dynamics underpinning those ecosystems remain poorly understood. 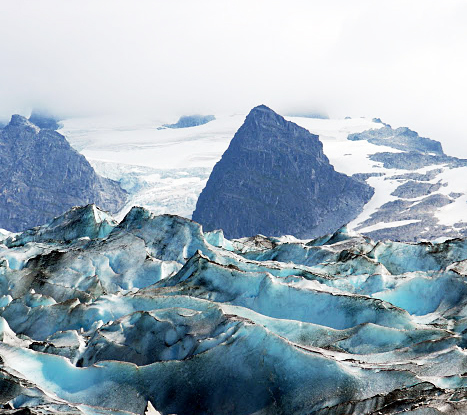 “Increased understanding of glacier biogeochemistry is a priority, as glacier environments are among the most sensitive to climate warming and the effects of industrial emissions” said Stubbins. Globally, glacier ice loss is accelerating, driven in part by the deposition of carbon in the form of soot or “black carbon”, which darkens glacier surfaces and increases their absorption of light and heat. Biomass and fossil fuel burning by people around the globe are the major sources of that black carbon. 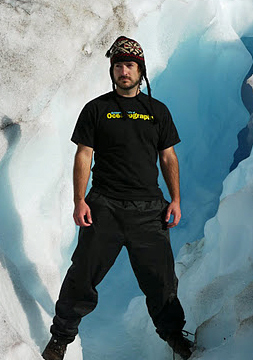 Stubbins and his fellow scientists have conducted much of their research at the Mendenhall Glacier near Juneau, Alaska. Mendenhall and other glaciers that end their journey in the Gulf of Alaska receive a high rate of precipitation. High levels of rain and snow acts to strip the atmosphere clean of organics, dumping it on the glacier. Consequently, these glaciers are among the most sensitive to global emissions of soot. A warming climate will increase the outflow of the glaciers and the accompanying input of dissolved organic material into the coastal ocean. This will be most keenly felt in glacially dominated coastal regions, such as those off of the Gulf of Alaska, Greenland and Patagonia. These are the areas that are experiencing the highest levels of glacier ice loss. “Although it is not known to what extent organic material deposition has changed and will continue to alter glacially-dominated coastal ecosystems or the open ocean, it is clear that glaciers will continue to provide a valuable and unique window into the role that the deposition of organic material plays in our changing environment,” Stubbins said. Stubbins collaborators on the project included Eran Hood and Andrew Vermilyea from the University of Alaska Southeast; Peter Raymond and David Butman from Yale University; George Aiken, Robert Striegl and Paul Schuster from the U.S. Geological Survey; Patrick Hatcher, Rachel Sleighter and Hussain Abdulla from Old Dominion University; Peter Hernes from the University of California-Davis; Durelle Scott from Virginia Polytechnic Institute and State University; and Robert Spencer from Woods Hole Research Center. The Skidaway Institute of Oceanography is an autonomous research unit of the University System of Georgia located on Skidaway Island in Savannah, Ga. The mission of the Institute is to provide the State of Georgia with a nationally and internationally recognized center of excellence in marine science through research and education. 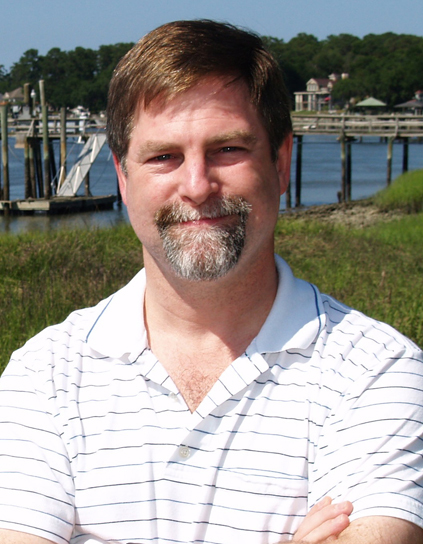 Skidaway Institute of Oceanography scientist Clark Alexander has begun a multi-investigator project to assess the vulnerability of the Southeast Atlantic coast to future threats ranging from sea-level rise to shoreline erosion. The project is funded by a $377,000 grant from the National Oceanographic and Atmospheric Administration. It is part of a larger, $1.06 million project awarded to the Governors’ South Atlantic Alliance (Alliance), to coordinate efforts in Georgia, Florida, South Carolina and North Carolina to develop a consistent method of assessing coastal threats in the four states. “Our overall goal is to develop a process to evaluate our coast’s physical and economic vulnerability to hazards like sea level rise, flooding, storms, hurricanes and erosion, and do so in a uniform way throughout the region,” said Alexander. A key component of the project is further development of a computer program called AMBUR. Originally created by Georgia Southern University’s Chester Jackson when he was a graduate student at Skidaway Institute, AMBUR is a powerful tool to evaluate erosion and accretion on a changing coastline. While Jackson is working on AMBUR, Alexander and his team will be collecting data on coastal physical, biological, demographic and economic parameters, while also meeting with coastal managers from the four states comprising the Alliance to determine which parts of the Southeast coast are most critically in need of assessment. Once identified, these areas will become the first coastal regions targeted for analysis with the new AMBUR tools. When completed, the scientists will be able to present coastal managers with information and maps describing coastal vulnerability for at least a portion of each state. Future funding will be sought to expand the analysis to the whole southeastern coastal region. “By its very nature, this project will identify the most vulnerable areas along the coast and will provide an unbiased analysis of the incentives and disincentives for development in those areas,” said Alexander. The project is expected to run for 18 months.